Chrome and glitter, rotating light columns with magically changing colours. A fascinating spectacle of light and sound. That is the Wurlitzer ONE MORE TIME (short form OMT) CD. Today's life-style has rediscovered the nostalgic charm of the forties and fifties. The beloved design of those days with chrome and glitter is a welcome change to the priority of functional and abstract features which dominate nowadays. The Wurlitzer One More Time combines both. The faithful design of the legendary Wurlitzer 1015 of 1946 is the ideal casing for the sophisticated Wurlitzer CD changer. Now the music of Glenn Miller sounds in pure CD quality. But not just Glenn Miller, the One More Time CD plays up to 2500 hits and evergreens in superb laser sound quality. No matter where the OMT CD is located, whether it is the entrance hall of a company, a restaurant, a bar or a living room - this nostalgic jukebox will always be the optical and acoustical eye catcher. 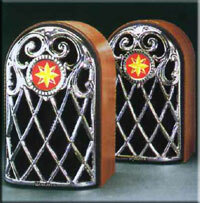 The Wurlitzer OMT CD is characteristic for its special exclusivity and individuality. 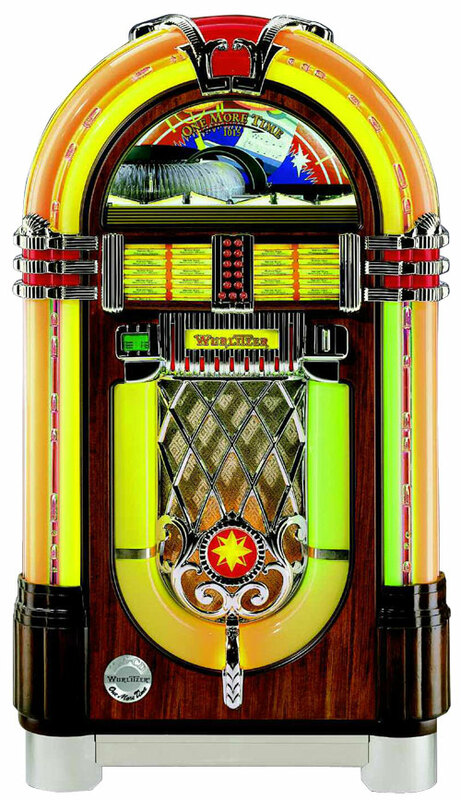 • Height 152.0cm - 60"
• Width 81.5cm - 32"
• Depth 64.0cm - 25 1/2"
Rudolph Wurlitzer founded THE WURLITZER COMPANY in 1856. At first he imported musical instruments and opened sales outlets in all big American cities. He started production of pianos in America in 1880. In 1896 the 'Tonophone', the first coin-operated piano, was introduced to the market.